lets you match-up bit diameters with the materials you're boring to prevent workpiece burning & preserve the temper of your bits. Not even the most costly commercial boring machines offer this capability. far surpasses that of all commercial Boring Machines. Twin miter gauge slots & versatile rip fence can be used to hold / guide your workpieces and serve as stops, providing added control & repeatability. Rigid & floating extension tables make easy work of handling large or long boards. 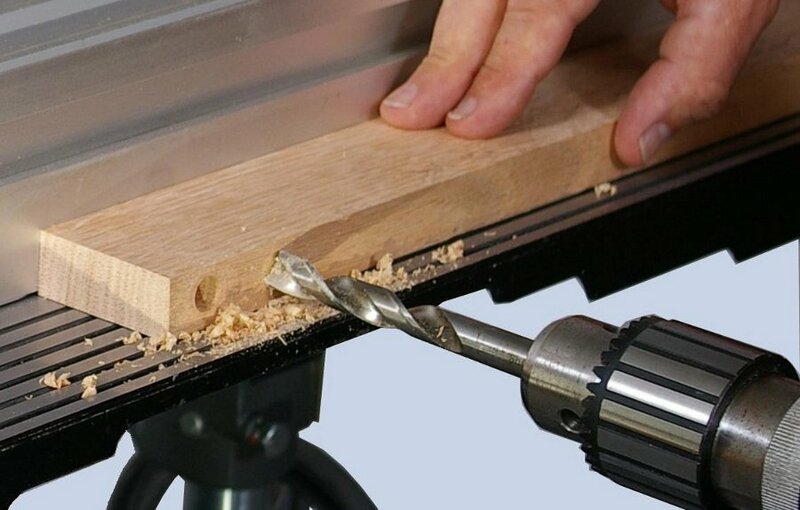 lets you perform compound angle drilling operations such as that required for doweling shadow-box picture frame joints. Switch to Shopsmith's router chuck or optional hollow chisel mortiser & you can easily perform slot mortising or hollow chisel mortising operations on the ends of long or cumbersome workpieces in the horizontal position. Horizontal Boring Machines are major time-savers for a lot of different jobs... and if you don't believe that -- or have never heard of a horizontal boring machine... just ask an experienced cabinetmaker. Fast, Convenient Precision Doweling... The most obvious application for this machine set-up is doweling. 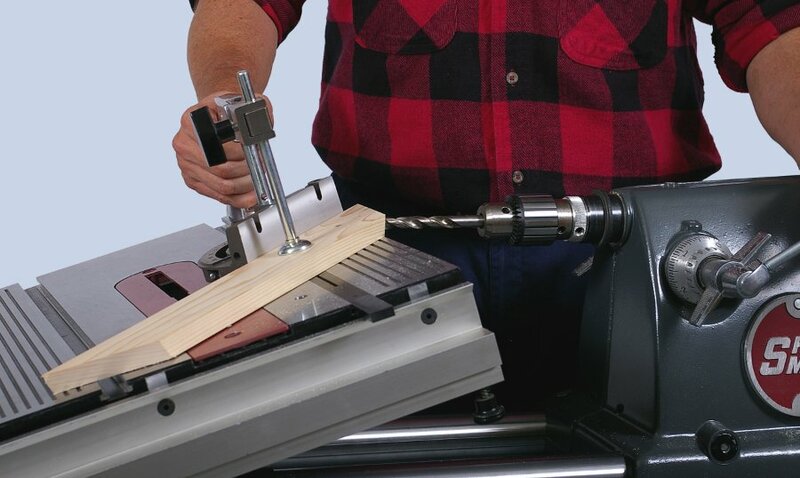 Imagine being able to lay your drill press on its side, tilt its table 90° and drill dowel holes in your workpiece edges while their broad, flat surfaces are fully supported by your large worktable surface. Shopsmith's horizontal boring machine function allows you to do exactly that. Just align your worktable so it's parallel to your drill bit... move it up or down to position your holes near the centerline of your workpiece edges... set the quill feed depth... and start boring. Exacting Precision and Repeatability are Assured... Thanks to its unique table system, the accuracy of the Shopsmith horizontal boring machine stands toe-to-toe with commercial models. Its full tilting action and rack-and-pinion height adjustment make precise alignments quick and easy. Add Shopsmith's standard extension tables, then use your rip fence as a backstop and you can create a giant work surface that easily supports the largest boards. Use your adjustable quill feed depth-of-cut dial and lock to quickly read and set hole depths (up to 4-1/4") with matchless precision. Center Drilling in the Horizontal Position... Another type of horizontal boring (called center drilling) can also be performed on your Shopsmith... but not on any other boring machine that we know of. There are two methods for performing this operation. Using the first method, the workpiece (usually a turned object such as a spindle, goblet or lamp standard) is attached to a faceplate, lathe chuck or drive center. The drill bit is inserted into the drill chuck, which is attached to Shopsmith's optional tailstock chuck arbor. The tapered end of the arbor is then inserted into the lathe's tailstock. When the machine is turned on, the workpiece is rotated and advanced into the stationary bit by the quill feed. Center-to-center alignment is easy to establish with this set-up, making it a highly recommended method for boring deep or long holes. Mortising in the Horizontal Position... When you need to create a mortise in the end of a long board... or the edge of a wide panel... this operation can be far more easily (and more accurately) performed in the horizontal position. The Shopsmith table system can be easily configured to provide all the support you'll need for this operation. Use your rip fence as a backstop and a C-Clamp or handscrew clamp to hold your workpiece in position on the table surface. 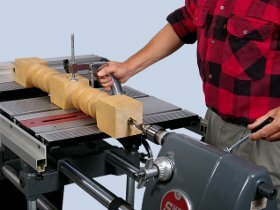 At this point, you can create slot mortises with drill bits... or use Shopsmith's optional hollow chisel mortiser. The Right Speed for the Job... And, of course, as with all operations, the variable speed feature (250 to 10,000 rpm) of the PowerPro Headstock lets you match your machine's speed to the wood species and drill bit diameter for smoother holes without burning. Even the expensive commercial boring machines don't offer this kind of variable speed flexibility ! Here's a valuable tip: As long as you always keep the same (top or bottom) surface of all boards against the worktable surface when boring, all dowel holes will be in top-to-bottom alignment... even though they may not be in the exact center of your boards.